Is video of Syrian 'hero boy' authentic? 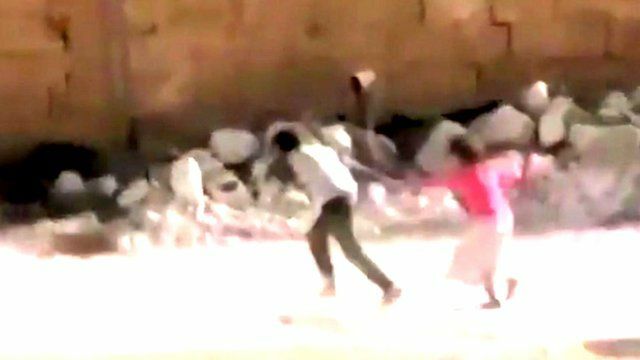 Jump to media player Millions have watched a video of a boy in Syria seeming to rescue a girl under gunfire, but its authenticity has been widely questioned. Why Kim Kardashian is tweeting about Syria Jump to media player US TV star weighs into Syria crisis with #SaveKessab campaign. Syria's nine-year-old YouTube storyteller Jump to media player An online series filmed in Aleppo was a hit on YouTube, and is now to be shown on Arabic language TV. 46 catcalling video copycats Jump to media player 46 copycats, tributes and parodies of '10 hours walking in NYC as a woman'. 90-year-old 'Samaritan' third arrest Jump to media player Arnold Abbott became an online hero after being arrested twice for feeding the homeless in spite of a new law forbidding it. Now, he plans to defy the law once again. A song for southern India Jump to media player An Indian comedy group scores a YouTube hit with a musical tribute to the south of the country. School science experiment backfires with a bang Jump to media player A failed school science experiment goes viral in Egypt, sparking a debate on education. Murdered for tweeting? Jump to media player How a woman in Mexico was targeted by drug cartels for her posts on Twitter. Man v Subway Jump to media player How racing the tube became a worldwide trend. Far right on Facebook Jump to media player How far right groups like Britain First are gaining support online. The female pilot taking on IS Jump to media player Twitter storm as female Emirati pilot joins fight against IS. #BBCtrending: Is video of Syrian 'hero boy' authentic? A video purporting to show a Syrian boy under gunfire pretending to be dead in order to rescue a young girl has been viewed over 5 million times. Some may find the content of the video disturbing. While many have proclaimed the boy as an inspirational hero, its authenticity has been widely questioned. #BBCtrending spoke to Amira Galal of BBC Monitoring's Middle East team about the difficulties of verifying the truth behind it. Update: Since writing this blog, BBC Trending has confirmed that the video was faked, after speaking to a group of Norwegian filmmakers who said they shot the video in Malta earlier this year. Want more? You can watch all our videos on BBC Trending's YouTube channel.